I enjoy having groups of people over, especially during the holidays. We always have a large Christmas party for my husband’s staff and their families. We also enjoy having family and/or friends over for Thanksgiving and Christmas. Over the years I have learned what makes these gatherings much easier on me and that is planning, planning, and more planning. We have had our office party at our house for quite a few years now. Each year I seem to find ways that save me time. But the one thing that I always do is to keep detailed lists of things to do and things to make. Several years ago I read a tip from Martha Stewart about a party planning notebook. I immediately realized this would save me a lot of time. I loved the idea and realized that I should have been doing a notebook a long time ago. 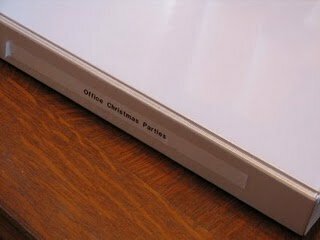 I now do a notebook like this each year for the office parties. I also do one for holidays and any other large gatherings that we have. Not only does this notebook help me keep track of what I need to do, but it helps me keep track of what I have made from year to year. Even if you do not host a large gathering for the holidays a notebook like this would be helpful to use for children’s birthday parties or barbecues in the summer. So, here is a look at my office party notebook. I always label the side of the notebook. This tells me if it is my office party book, my Thanksgiving and Christmas book, or my book for other gatherings. 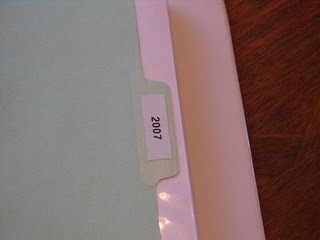 I use dividers to label the years. This way I can use one notebook for several years. I also use page protectors in my notebook. It keeps the pages clean and allows me to write on them. I use a dry erase marker to make any notes I need. I make a list of the recipes that I want to make. For the office party I start this list several months in advance. 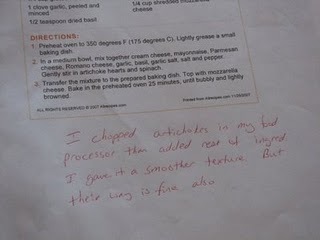 When I see a recipe that I want to try I make note of it. 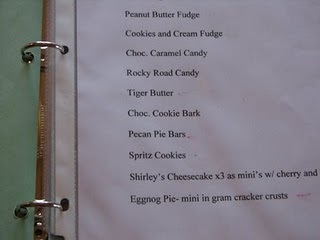 Then a couple of weeks before the party I narrow the list down to what I am going to make. I then make a list of the recipes. 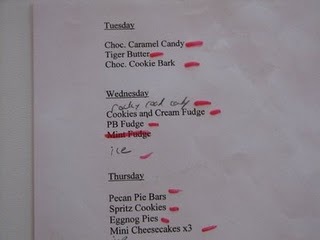 I also make a copy of each recipe and make note of any changes I want to make. After the party I make note of what I liked or disliked about the recipe. I also make note on whether or not it was a popular item. I don’t want to make the same cookie that no one likes year after year. But if something is really enjoyed than I might want to make it again. I also make a list of what I need to do. I do this for each day. Usually I start making some of the candy three to four days in advance. A list like this keeps me on track. I am also able to mark things off. This makes me feel like I have accomplished things instead of getting overwhelmed with what I have left to do. I also make a list like this for housecleaning jobs that I need to do the week before a party. I have also found it helpful to include grocery lists in my notebook. You can probably tell that I am a planner and scheduler. I need lists and plans, especially when I am planning for a party or even company. I know most of you don’t plan an office party, but I am sure you will plan some event that this would apply to, maybe a wedding or baby shower, Thanksgiving dinner or superbowl party. A plan like this will save you a lot of time. A notebook like this works for me.